THIS IS A DEEP INSIGHT INTO THE IDEAS OF FFX. CHANCES ARE, THERE'LL BE SPOILERS GALORE. BE WARNED. 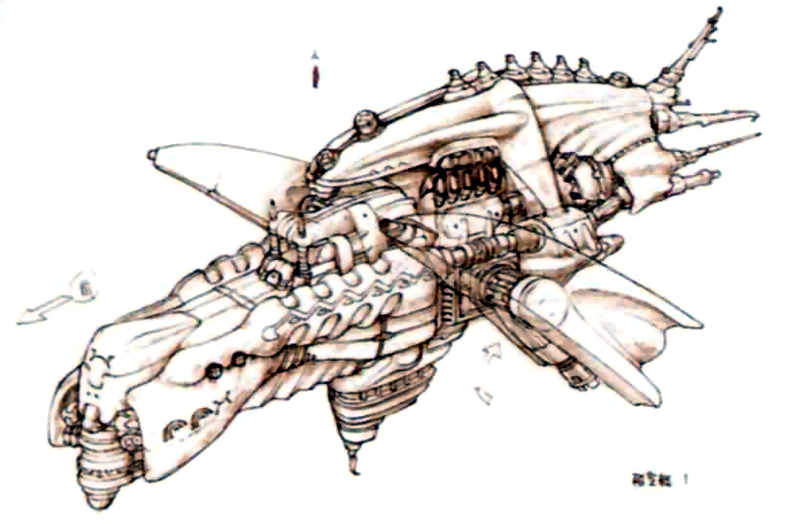 I can guarantee that the very early concept arts for FFX consisted of two thirds of the aforementioned statements. And truly, they are something special. Those with the Limited/Collector's Edition of FFX HD Remaster, and the even luckier ones with the FFX Ultimania guide, would know what I am talking about. 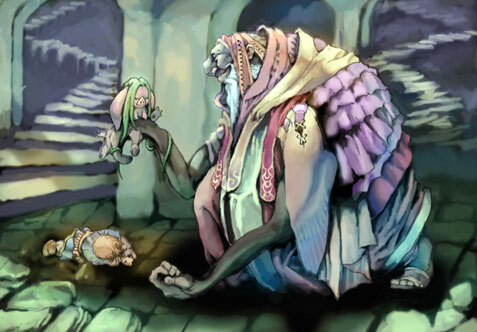 These strange, quirky, and dare I say, expertly-crafted drawings, displayed a lost and often deeper side to the world of Spira. As if it wasn't already lost and deep enough. 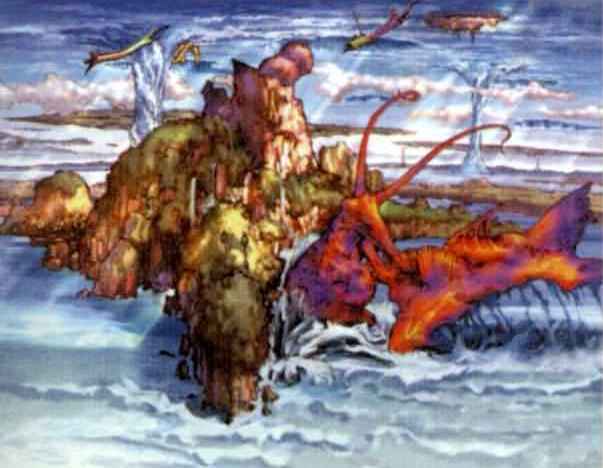 Thanks to the wonderful people at the Final Fantasy Wiki, these drawings have withstood the test of obscurity to the West, and as such, I will be displaying them here for fun and insightful discussions regarding their contents, and how the game might have changed if they were implemented into the final game. Sit back, and enjoy the mindboggery. 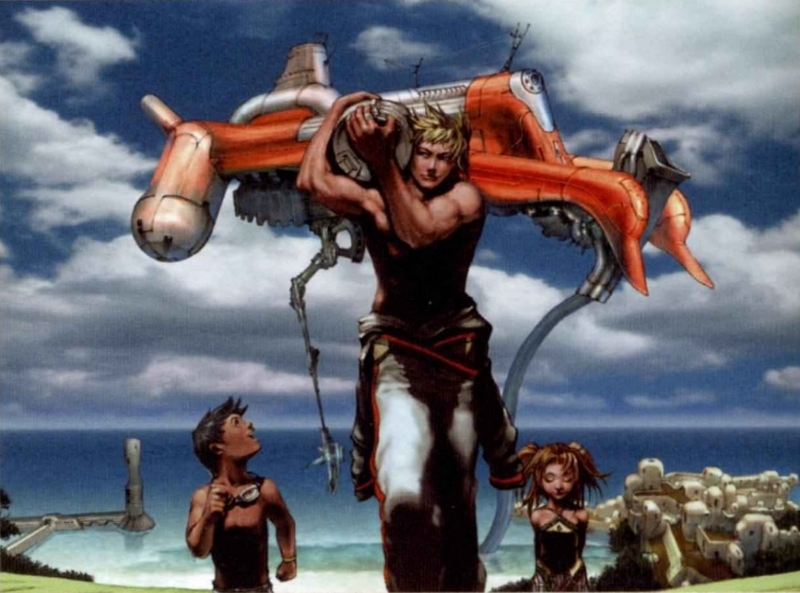 Fun facts: According to Isamu Kamikokuryo, he originally imagined Tidus as a plumber who did underwater pipe construction and dispatched underwater fiends, while also having the attitude of an aggressive Japanese gang member, but the idea was scrapped as Yoshinori Kitase thought it would make for a weak main character. This was also changed because the job would have made Tidus have a sad personality, which was not their aim. 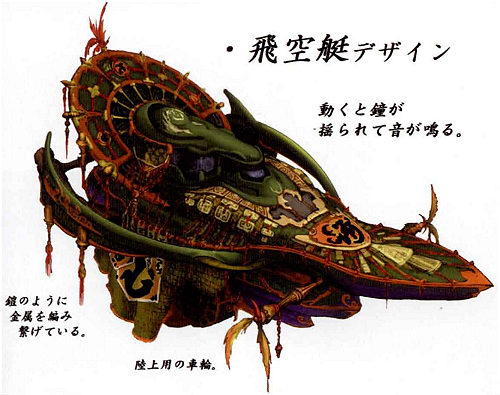 Auron was originally going to be a member of the Crimson Blades; a fiend extermination squad in Zanarkand. Tidus was originally going to be the unsent of the gang. 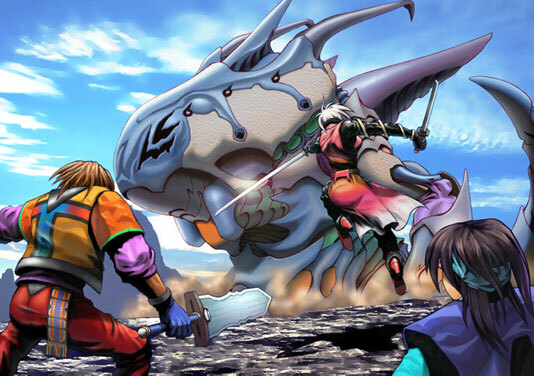 However, since the game started development in 1999, and The Sixth Sense came out the same year with a similar plot point, they gave the role to Auron instead. Auron, at one point, was going to be Jecht in disguise. This was so that Jecht could know what Tidus was doing all this time. However, Nojima didn't want Jecht to be part of the main cast, so the idea was dropped. Final Fantasy X originally wasn't going to be a Final Fantasy game at all, but a series called 'Seventeen.' The story revolved around a recent unknown disease that killed people on their seventeenth birthday. Yuna would have had the role of a doctor/nurse that went around giving the disease's cure to its inspected victims. It is eventually revealed that the 'cure' was in fact the source of the disease, and that it was established by the company that Yuna was working for to rule the world, by claiming that they were the only ones that could provide the cure in the first place. It is unknown what role Tidus and Auron would have had, if they were even thought out as characters in the first place. That being said, some of these concepts could have been made for Seventeen and not FFX. 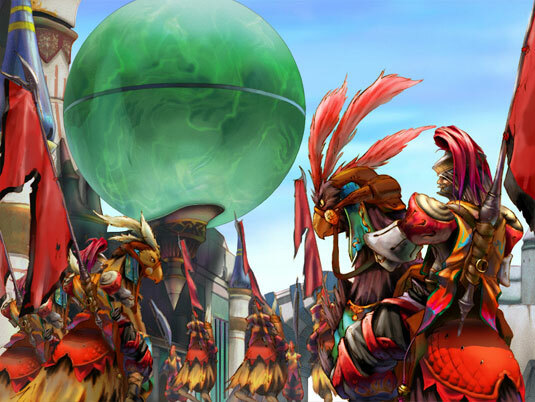 As seen in the beta trailer for Final Fantasy X, the game was going to have online features implemented into it. 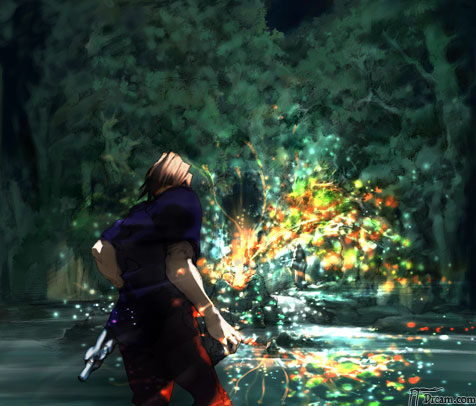 The gameplay would show an early version of Tidus running around the Calm Lands/Remiem Temple, then opening up a menu and connecting to PlayOnline: Square Enix's online server. It would then display a guide of the area and what fiends could be found. The idea was scrapped not long after. This could be why in the PS2 version of FFX, on the main menu screen, there is a URL leading to PlayOnline's website next to FFX's official website. Keep in mind that these names are placeholders, and are not necessarily the real names of the drawings. 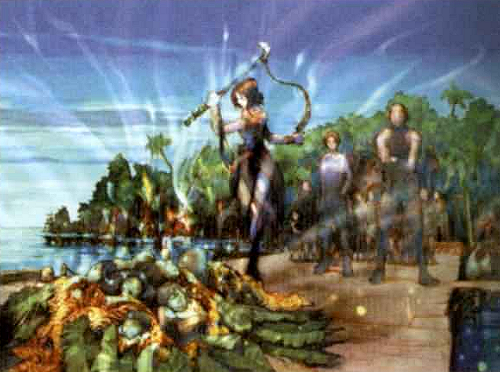 Arguably the most 'famous' FFX early concept. 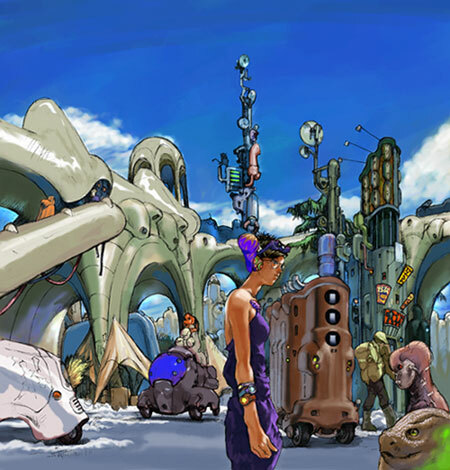 Depicts early designs of Tidus (left), Yuna (middle) and Auron (right) walking down a street. The only one who seems to bear any familiarity with the final design is Tidus, as seen with his blue eyes, hair colour and hair structure. Three characters designs, two of which are unknown in identity and whether they were previous versions of existing characters or not. The person in the middle strongly resembles Tidus. Another Tidus prototype and 2 other characters fighting what is guessed to be an early version of Sin. Appears to be a lot smaller and more shapely in appearance. Appears to be a leftover water temple design. Very different in layout compared to the final temples in the game. Perhaps they were planning to implement a water temple into the game. 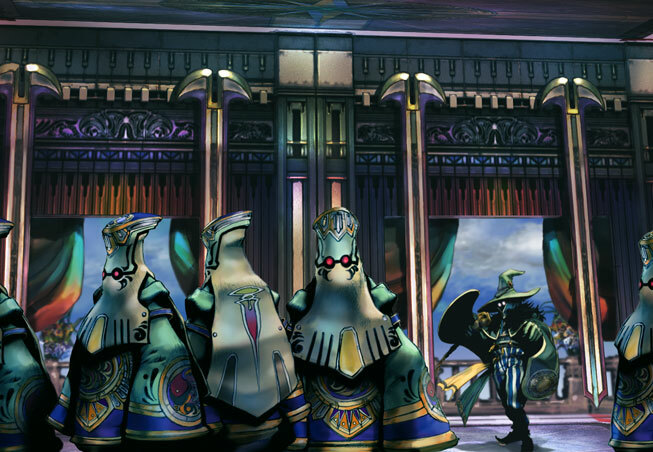 Displays some cloaked men (with what appears to be the early Yevon sigil on the back of one of them) and a mysterious character that resembles a black mage. Displays an unknown character approaching an erupting geyser in Macalania Woods. Early design of Macalania Woods. 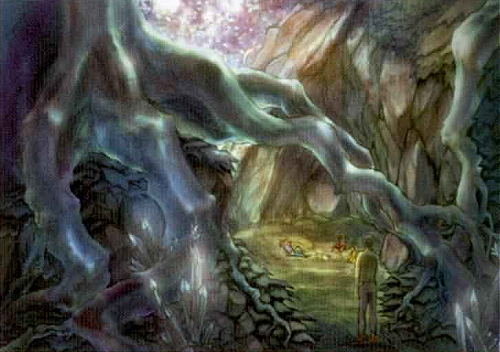 Displays a lot more greenery and a character who is of an unknown race. 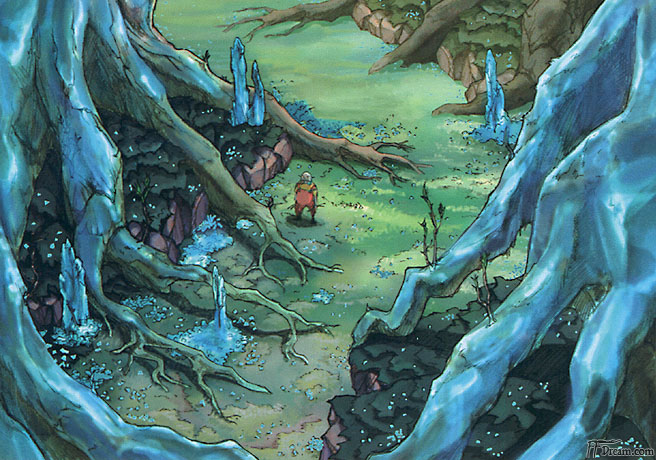 Early design of the party's hidden campsite in Macalania Woods. Unlike the final game, it is lit by daylight. Town design. Appears to be rundown and populated by humans, shoddy machina, and fiend-like creatures. 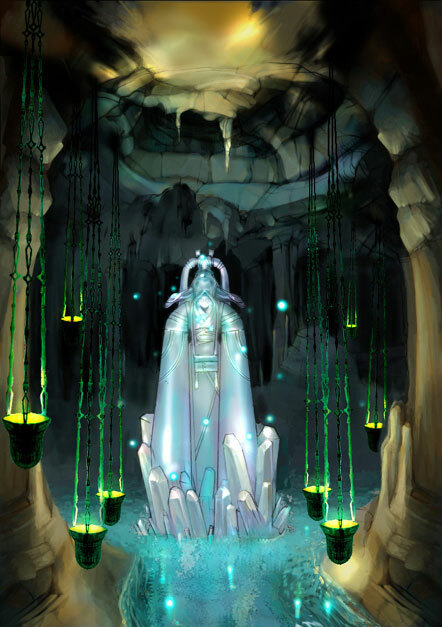 A crystal statue located in an ancient cavern. Might be an early design of the fayth statues. (I apologise for the low quality.) An early concept of the Sending in Kilika. Major differences include the summoner sending the piles of deceased on solid ground, rather than in underwater caskets. Also, Yuna appears to be less clothed in appearance. 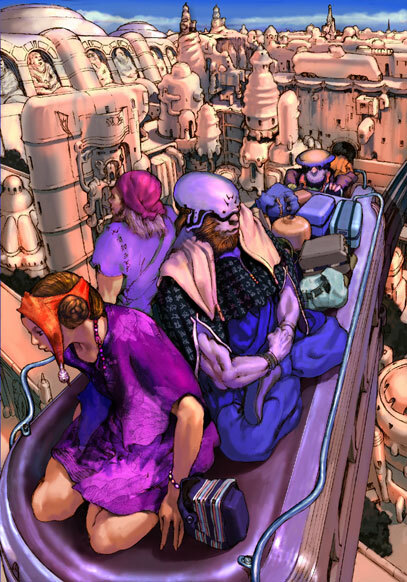 Four people, two of which are of an unknown race, riding an Arab-inspired taxi through an unknown city. I think that this was the original shoopuf transportation. 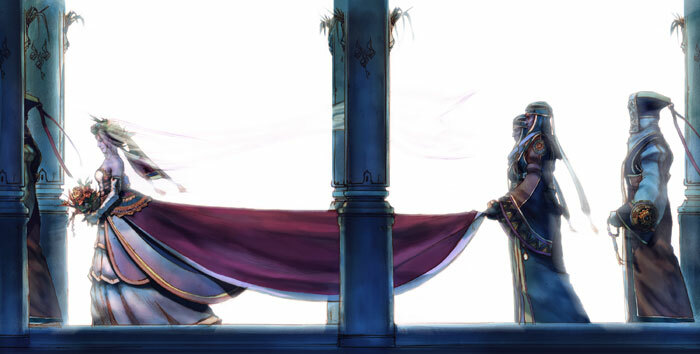 Early design of Yuna's forced wedding. Dress design appears to be more Victorian and detailed. Outer design of a cave/temple. Since it's built into a ravine, it might be possible that this was the original Cavern of the Stolen Fayth. Three characters. Large person with long arms holding an unconscious pig-like creature. 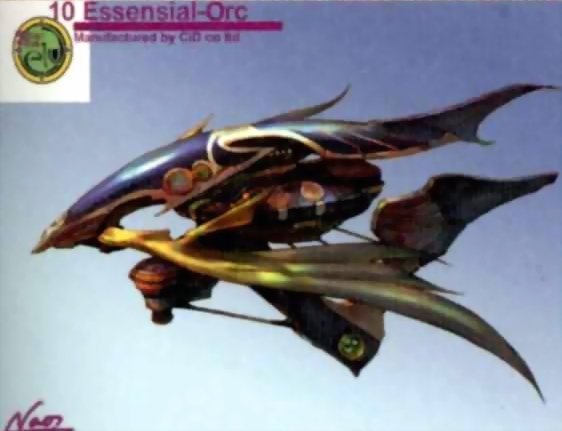 Could be race designs that were never used. 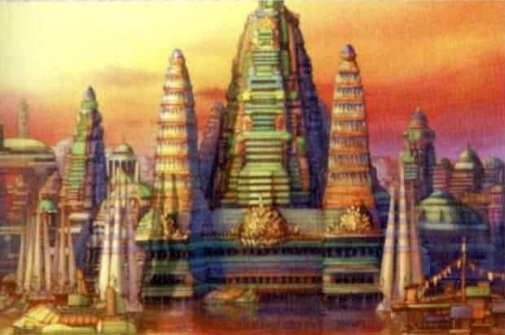 Early design of Remiem Temple. Appears to be more in ruin and has a hole that appears to go underground. 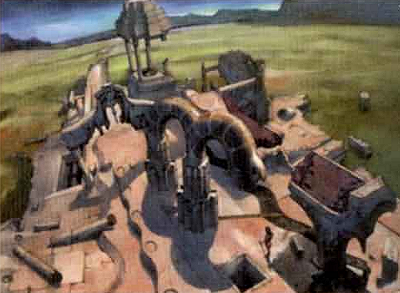 An early design of Zanarkand (which was originally called Registan). Possesses a more Ancient Egyptian theme. Boats seem to be a main method of transportation. 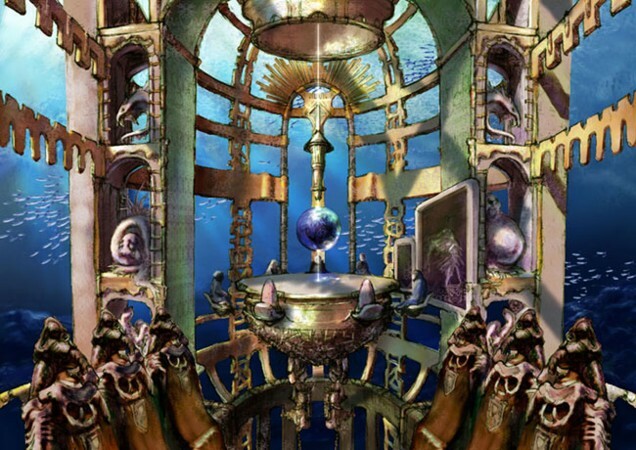 Speaking of boats, did you know that Tidus lived in one back in Zanarkand? Detailed drawing of the boat above water. Unfortunately, due to the low quality, the hiragana/kanji cannot be read. Another Sin design attacking an island. This time, Sin appears to be a type of crustacean. More interesting things to note are the giant birds, the water column in the background, and the floating island in the top right. Early Ronso design. The male is of a darker blue and has more fur, while the female has longer ears and is of a different colour. 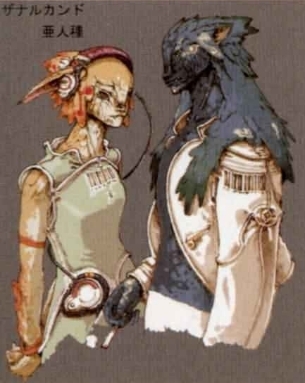 Clothing implies that they originally belonged to a more modern civilisation; katakana translation could imply that they were part of Zanarkand's populace before they got their own habitat. Three unknown characters in what is guessed to be an early version of Besaid. It is unknown what the heap of machina could be. 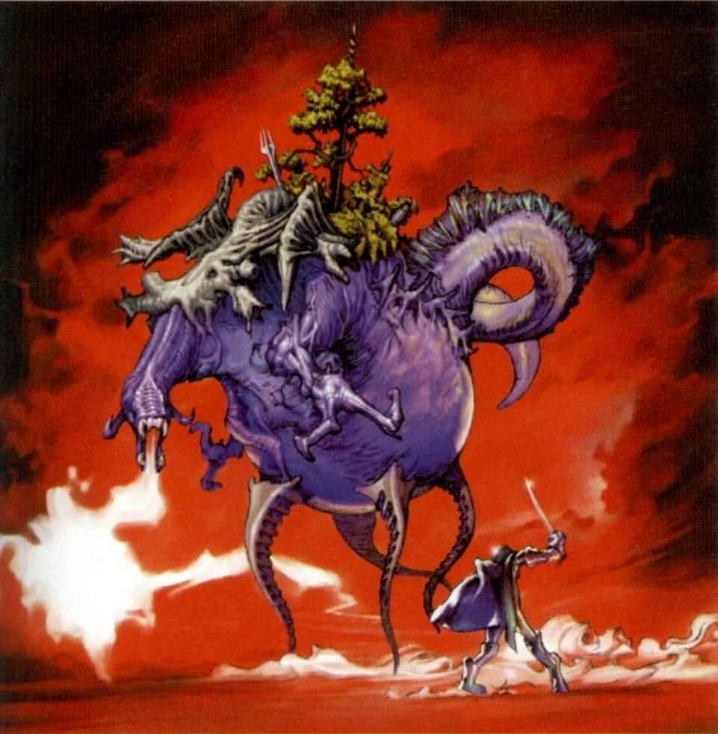 Unknown character fighting a four-legged fiend with a tree growing on its back. Currently, I don't know if any fiend similar to this exists in the game. 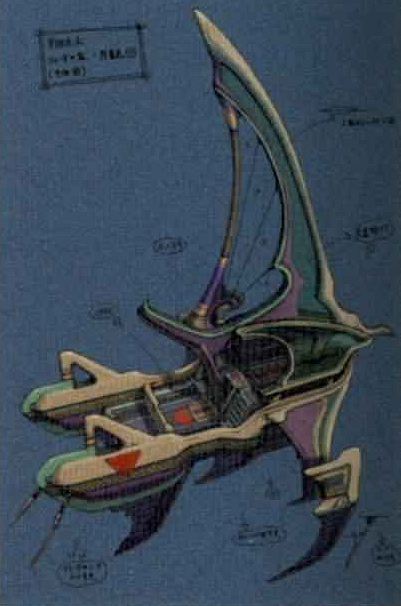 Early design of Spira. 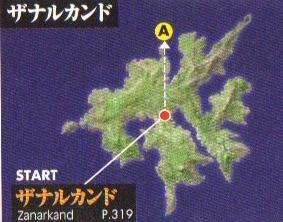 Originally, Zanarkand was located in the centre of the world. 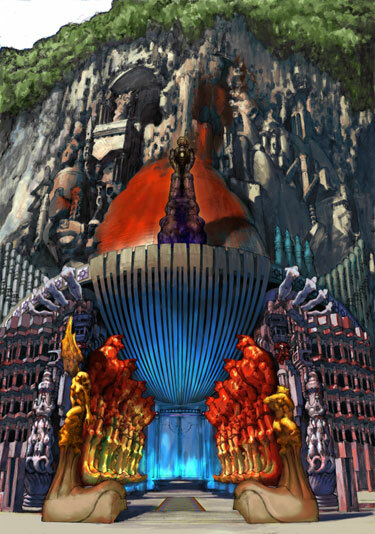 The original Amano artwork for the FFX logo, first seen in the beta trailer for the game that was seen at the Square Millennium Event in 2000. 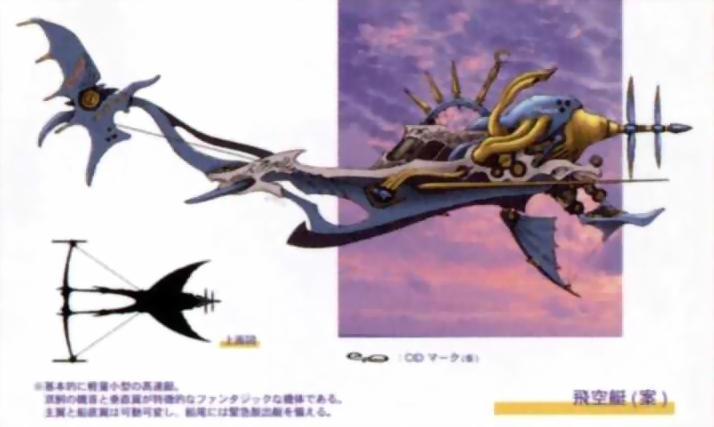 Displays a front view of Yuna's face, with a profile of an airship behind her. A 3D render of Tidus and what appears to be an early concept of Blitz Ace, his final Overdrive. Noticeable differences include the design of the blitzball, the fire elements, and the way the attack is executed. Early 3D concept of the blitzball minigame. 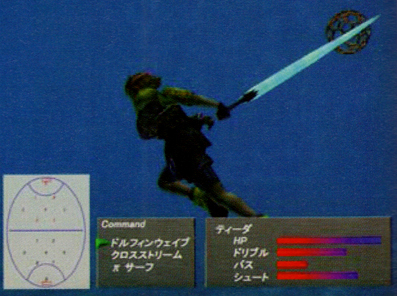 It seems as though originally, players had to knock the ball around with their weapons. The map is also oval-shaped instead of completely round. Early concept of the Chocobo Knights. Armor is a lot more detailed, and features chocobos in different colours. 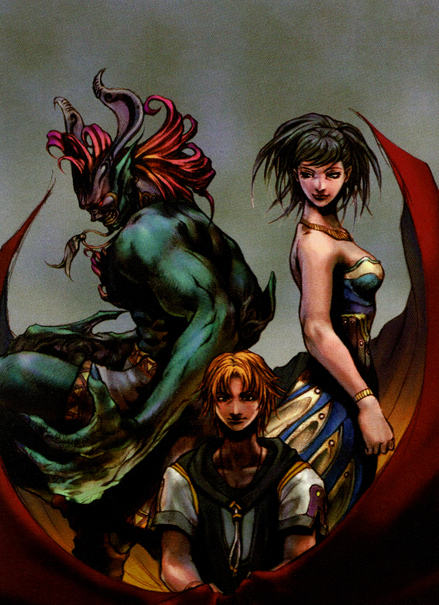 Cover art for 'Seventeen: Angelic Impact X Devil's Shock,' which was Final Fantasy X's original concept. 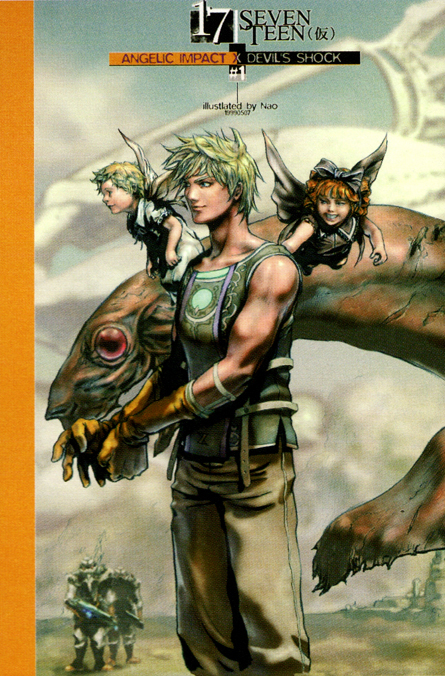 Features what are guessed to be early designs of Tidus and Sin, with two angelic characters, two guards and an airship in the background. 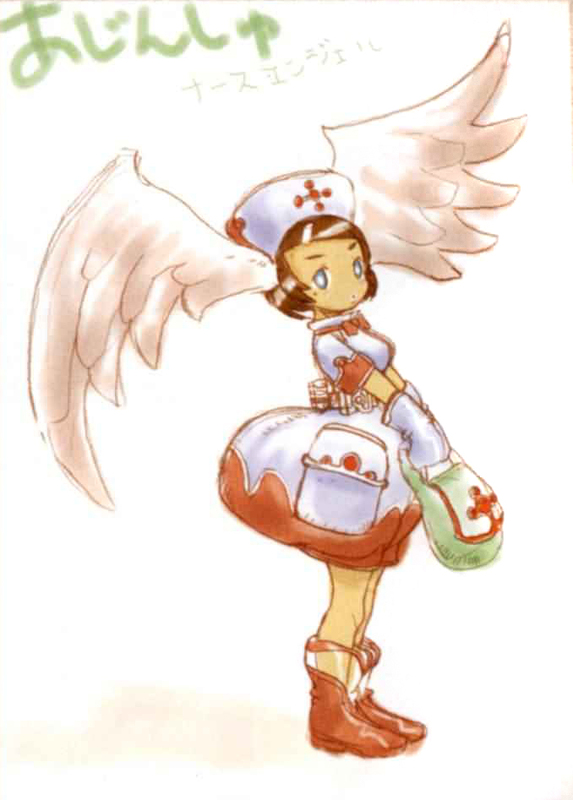 Design of an angelic nurse. It's possible that this was Yuna's 'Seventeen' design, based on the concept, the similar pose and the similar hairstyle. Will update in spare time. Thanks for reading! I've never seen any of the early concepts until now (I notice the first 2 pictures were included in the audio drama and they definitely got my attention...surely you jest). The second picture does look like Tidus, Yuna (or perhaps Lulu), but the beast looking one....could it be Kimahri or an Aeon like Ifrit? The rest of the pictures definitely look very interesting! Thank you for posting this up! To be honest, I'm quite sad that Seventeen didn't ever come to light. It has a pretty cool setup, not original by any means these days, but the world could have been creative seeing as how there's both adult humans and child angels. I'm a pretty big fan of that art style, too. It looks gorgeous. I could stare at that cover-art all day. By the cover-art, it also seemed to have started out as a comic series or a manga of sorts. There's no real confirmation that Seventeen was necessarily going to be a game, though. Also, is it just me, or do those two angels look a tiny bit like Kurgum and Chuami? The hair and the faces seem to say so. 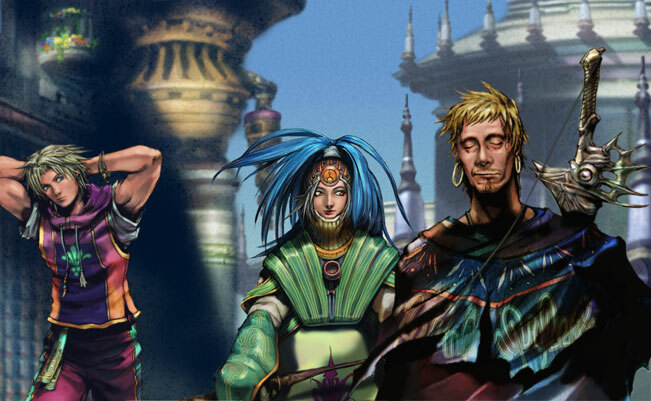 Anyone else interested in FFX's prototype?